The red carpet was awash with stars at The London Royal Premier of Spectre at the Royal Albert Hall tonight. Two Irish Students – winners of The Bank of Ireland Junk Kouture Glamour Prize – walked the red carpet alongside James Bond actors Daniel Craig, Christopher Waltz, Lea Seydoux, Ben Whishaw, Naomie Harris, David Bautista, Monica Bellucci, Ralph Fiennes and director Sam Mendes, in their ‘Kouture’ creations. The Duke and Duchess of Cambridge, Prince William and Kate Middleton, took a well-deserved night off from their two young children and made an appearance to watch the latest Bond movie. Prince Harry joined the royals in London tonight too. Secondary school students Julie Quinn (Cardonagh Community School, Donegal) and Adelina Hmelevska (Moate Community School, Westmeath) modelled their stunning Bank of Ireland Junk Kouture winning outfits ‘Sheer Glass’ and ‘Mediva.’ Their designs were on par with other celebrity outfits as they rubbed shoulders with big Hollywood names. Bank of Ireland Junk Kouture is a leading fashion and art competition open to all secondary school students across Ireland. Entrepreneurs Elizabeth Curran and Troy Armour started the creative competition in 2010. 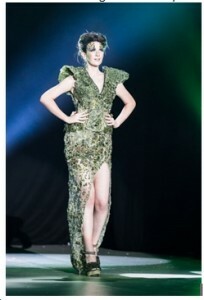 The fashion contest encourages entrants to think about the importance of sustainability and recycle materials through a mix of fashion and creativity; it is a one-of-a-kind contest. Make sure to keep an eye on the Bank of Ireland Facebook page and Twitter page to stay up to date on competitions, ticket giveaways and upcoming events. Bank of Ireland Junk Kouture Recycled Fashion Competition 2015 is proudly supported by Bank of Ireland and is open to all second level students in both Northern Ireland and the Republic of Ireland. The deadline for submission of entries for the 2016 competition is 29th January 2016.